For the satirical German weekly inspired by this novel, see Simplicissimus. Frontispiece of Grimmelshausen’s book Simplicius Simplicissimus. Simplicius Simplicissimus (German: Der abenteuerliche Simplicissimus Teutsch) is a picaresque novel of the lower Baroque style, written in 1668 by Hans Jakob Christoffel von Grimmelshausen and probably published the same year (although bearing the date 1669). Inspired by the events and horrors of the Thirty Years' War which devastated Germany from 1618 to 1648, it is regarded as the first adventure novel in the German language and the first German novel masterpiece. The full subtitle is "The account of the life of an odd vagrant named Melchior Sternfels von Fuchshaim: namely where and in what manner he came into this world, what he saw, learned, experienced, and endured therein; also why he again left it of his own free will." The novel is told from the perspective of its protagonist Simplicius, a rogue or picaro typical of the picaresque novel, as he traverses the tumultuous world of the Holy Roman Empire during the Thirty Years' War. Raised by a peasant family, he is separated from his home by foraging dragoons and is adopted by a hermit living in the forest, who teaches him to read and introduces him to religion. The hermit also gives Simplicius his name because he was so simple that he did not know what his own name was. After the death of the hermit, Simplicius must fend for himself. He is conscripted at a young age into service, and from there embarks on years of foraging, military triumph, wealth, prostitution, disease, bourgeois domestic life, and travels to Russia, France, and to an alternative world inhabited by mermen. The novel ends with Simplicius turning to a life of hermitage himself, denouncing the world as corrupt. The novel is considered by some to contain autobiographic elements, inspired by Grimmelshausen's experience in the war. The historian Robert Ergang, however, draws upon Gustav Könnecke's Quellen und Forschungen zur Lebensgeschichte Grimmelshausens to assert that "the events related in the novel Simplicissimus could hardly have been autobiographical since [Grimmelshausen] lived a peaceful existence in quiet towns and villages on the fringe of the Black Forest and that the material he incorporated in his work was not taken from actual experience, but was either borrowed from the past, collected from hearsay, or created by a vivid imagination." The adventures of Simplicissimus became so popular that they were reproduced by authors in other European countries. Simplicissimus was recreated in French, English, and Turkish. A Hungarian Simplicissimus (Ungarischer oder Dacianischer Simplicissimus) was published in 1683. The author remained anonymous but is now generally considered to be Breslau-born Daniel Speer. The story was adapted into a newspaper comic strip by Raymond Lavigne and Gilbert Bloch in 1954. In A.D. 1618, 12 million lived in Germany. Then came the great war. ... In A.D. 1648 only 4 million still lived in Germany. It was first performed in 1948; Hartmann scored it for full orchestra in 1956. The chamber version (properly Des Simplicius Simplicissimus Jugend) was revived by the Stuttgart State Opera in 2004. Magnus Pym, the lead character of John le Carré's 1986 novel A Perfect Spy, uses a copy of Simplicius Simplicissimus as the key to a book cipher. The Adventurous Simplicissimus, trans. Alfred Thomas Scrope Goodrick, London: William Heinemann, 1912. See also Project Gutenberg copy and later edition with new intro. The Simplicissimus Project, the 1912 trans. by A. T. S. Goodrick with material added by students at The College of William and Mary during spring 2002. 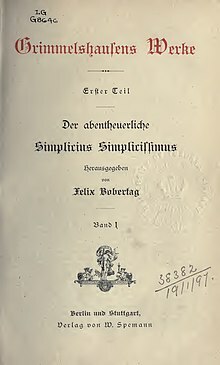 The German text is publicly available through Project Gutenberg: Simplicius Simplicissimus. PDFs of the original German-language edition, bearing the date 1669 but probably published (according to Dünnhaupt) already in 1668, may be downloaded from the Badische Landesbibliothek Karlsruhe and from the Herzog-August Bibliothek Wolfenbüttel. ^ Dünnhaupt, Gerhard, ed. (1980). "VD 17". Handbuch der Barockliteratur: Hundert Personalbibliographien deutscher Autoren des siebzehnten Jahrhunderts [Manual of baroque literature: One hundred personal bibliographies of 17th century German authors]. Hiersemanns bibliographische Handbücher (in German) (No. 2 ed.). Stuttgart: Anton Hiersemann. Chisholm, Hugh, ed. (1911). "Grimmelshausen, Hans Jakob Christoffel von" . Encyclopædia Britannica (11th ed.). Cambridge University Press. ^ Ergang, Robert H. (1956). The Myth of the All-Destructive Fury of the Thirty Years' War. Pocono Pines, PA: The Craftsmen. OCLC 905630683. ^ Ahmedaja, A., ed., European Voices III: The Instrumentation and Instrumentalization of Sound Local Multipart Music Practices in Europe (Vienna: Böhlau Verlag, 2017), p. 249. ^ Gyula Ortutay (1957). "A Magyar Simplicissimus" (PDF). Irodalomtörténeti Közlemények. 34. évfolyam (1–2. szám). Retrieved 2015-11-21. ^ Kater, M. H., The Twisted Muse: Musicians and Their Music in the Third Reich (Oxford: Oxford University Press, 1997). ^ Fritz Umgelter (Director) (1975). Des Christoffel von Grimmelshausen abenteuerlicher Simplizissimus [Grimmelshausen's adventurous Simplicissimus] (TV series) (in German). ASIN B00JFIPU4Y. ZDF.